Is The E-twow S2 Booster the Most Advanced Electric Scooter? 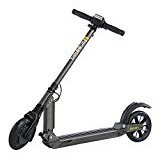 Without a doubt one of the best adult electric kick scooters we have reviewed, i need to bump the e-Twow S2 Booster up the comparison table because it’s so good. 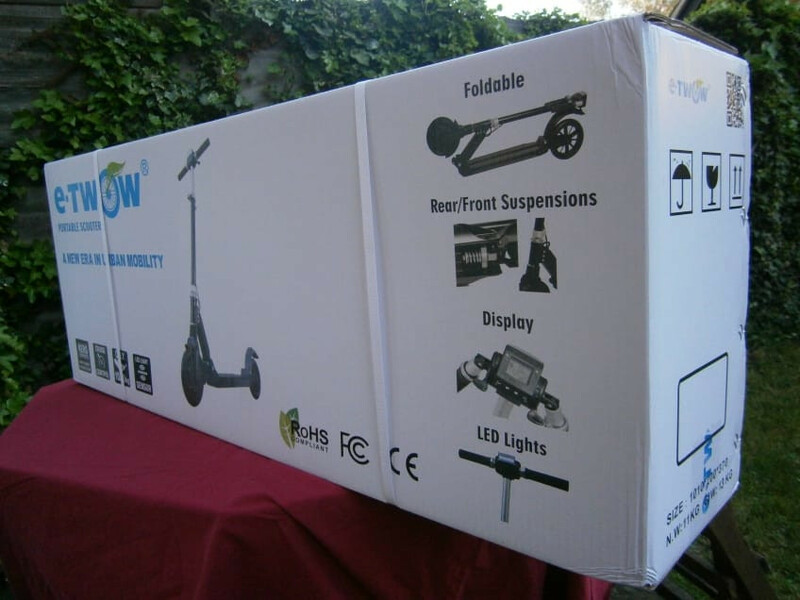 So I finally ordered the e-Twow electric scooter couldn’t wait to review it. 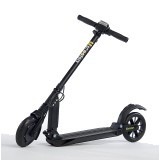 I love kick scooters in general and the e-Twow S2 is cool because it looks just like a regular kick scooter. I have spent a lot of time with my son enjoying kick-scooters over the years and now he’s 14 years old he’s looking for extra thrills. I have to say that he still adores the Oxelo Town 9 kick scooter which is his current favorite. It looks more adult because of the contemporary styling and front handlebar brake. However, after a week or so trying out the e-Twow it now looks as though I will have to give it up for good to my son as he will barely let me ride it anymore! We’ve been out to the park a few times with the e-Twow S2 and I have not needed to re-charge the batteries yet. The battery seems to have a massive capacity which is great. More on that later. I’ll try to structure this review so that you get a good feel for everything the e-Twow 2017 model electric scooter has to offer. I’ll try and keep within the article sub-heading topics to make it easier to read but my instinct is to just simply ramble and tell you how great the e-Twow electric scooter is. Did I mention that It looks like just a regular kick-scooter?! An innocent passer-by would not notice that it was electric if you were just kicking it like a regular scooter. How they pack all that power into the wheel-hubs and frame I’ll never know but you can feel the power of the motors particularly when you use the throttle to boost your kick-speed. Sure, it works as an electric scooter from the get go, but the real magic of the e-Twow presents itself if you are already traveling at speed, then you switch in the throttle. That’s why they call it the ‘Booster Scooter’. It will boost your speed by a considerable amount and therein lies the fun! Why is this e-Twow Booster Electric Scooter Called The 2016 Model? Apparently the battery life has also been extended because e-Twow now use top-quality Lithium batteries from Samsung. However, I cannot verify the extended battery life because I have nothing to compare it to. I can verify that they use genuine Samsung batteries as e-Twow are not sy about advertising this fact all over their promo material and the scooter’s box. What Does Booster Scooter Mean? The new e-Twow electric scooter is a booster scooter, but with a difference. As the name implies a Booster scooter will boost the speed that you are already traveling at. So for example if you are already kick-scooting without using the electric motor at a speed of 5mph, you will boost the speed by perhaps another 5mph by switching the motor on with the throttle. 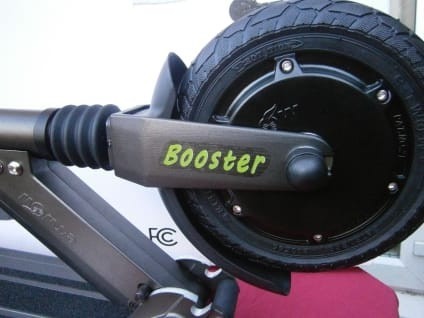 Many other booster scooters only have this functionality which means you cannot use them to accelerate from a standing start, you have to start the scooter by kicking it first, and then use the throttle once you are already moving along. I say that the e-Twow 2017 is a Booster Scooter with a difference because you can use the electric throttle from a standing start. In fact, it will accelerate from 0 – 10mph pretty fast. You can then kick with your foot to boost the speed even more. Although I haven’t done it, I can see how you could get up to 20-25mph pretty easily using a combination of kicking and electric motor throttle. I guess I have used this up to around 15mph, which is quite fast enough in the parks that I have been riding in. Is the e-Twow Booster Scooter Stable At Speed? In a word, yes. I have found that the e-Twow 2017 model is very stable at around 15mph and it seems heavy enough with a low centre of gravity that it would also be fine at 20-25mph. It’s a very sturdy beast. I do not use the word ‘Beast’ lightly because that’s exactly what it is. It looks just like a regular kick scooter, unlike the Uberscoot electric scooter or the Elite electric scooter, both which look much more like a motorbike in their styling thank the e-Twow kick scooter style. The e-Twow S2 is a heavy machine. It’s light enough to carry, but I wouldn’t want to carry it too far. For me it’s too heavy to use with a shoulder strap although that’s probably possible. The main point I want to make here is that this is not a flimsy machine that starts shaking when you get past 10mph of speed. It’s sturdy and solid and the front and rear suspension springs help absorb vibrations to give you a smooth ride. I wouldn’t be surprised if this e-Twow performed well at even 30mph. I guess I've taken it up to 20mph or thereabouts. How Does The Folding Mechanism Work? The cool feature that I’ve noticed about the display on the handlebars is that it has a light sensor and so the backlight turns on if the ambient light gets low. In layman’s terms, when it gets dark the display backlight automatically turns on. I love this feature as it adds to the overall feel of the e-Twow being a very hi-tech machine. As I’m in London, UK right now I bought the European version which has a European power socket. However, the display shows Kilometres per hour instead of Miles per hour which is a bit of a mystery to me as I don’t really know how fast I’m going. Before I publish this review I’ll actually check the speed conversion on Google for kmh Vs mph which will be more help to everyone. That said, the display shows the speed that you’re going, the battery charge state and a couple of other things that I don’t understand right now! I’ll look into what those other numbers mean. Other than my own ignorance of what the display is showing, it’s a very clear LCD type display and I can easily read it while riding the scooter without using my spectacles. Update: I was able to change the display from kmh to mph quite easily after reading the user guide. So when you get it, just switch it over and you will know exactly how fast you’re going! The throttle thumb control on the right hand side of the handlebar is super-easy to use. Just press your thumb down and you’re away. As I mentioned before, the motor has enough torque to get you going from a standing start but you will need to press the throttle down all the way to give it enough power to do that. I found that using the throttle sparingly was enough. The bearings on the wheels seem to enable the e-Twow to travel for quite some distance without extra kicking or electric power applied, so I used the throttle just to maintain my speed by pressing it down occasionally for a speed boost. I think that this method will also save the battery somewhat when compared to pressing the throttle down all the time. The most effective use of the throttle that I found was to first get up to speed while kicking the scooter and then pressing the throttle to give a speed boost. Using this method I was able to go pretty fast and I expect that this is how you could get up to 20-25mph. It’s pretty exciting feeling that speed boost when it kicks in and brings a whole new meaning to kick scooting. The thumb-operated handlebar brake on the left hand side is extremely sensitive. According to e-Twow it’s some kind of electro-magnetic brake which does not use friction on the wheels to slow down. It is incredibly effective and efficient so small and gentle thumb movements will slow this e-scooter down to a halt pretty effectively no matter what speed you are travelling. My experience is that the brake is so sensitive that it’s a bit of a surprise that the scooter slows down so quickly and a bit un-nerving at first. Practise with this brake and get used to it while going at slower speeds and you will see what I mean. That said, it’s one efficient braking system and works very well! The rear fender brake also activates the electro-magnetic brake and as far as I can tell it does not use friction to slow the scooter either. The fender brake is just as sensitive as the handlebar thumb brake but for some reason I found it easier to control this brake with my heel than the thumb brake. You just need to apply the tiniest amount of pressure with your heel and you can feel the scooter slowing down very quickly. Using both brakes at once might be a bit dangerous unless you are incredibly gentle on each. I like the addition of the rear fender brake. It gives you an additional braking option and adds to the feel of the e-Twow just being like a regular kick scooter – except with added steroids! It is worth talking about the suspension because it’s of such high quality. The front suspension is pretty rigid and the rear suspension is softer. 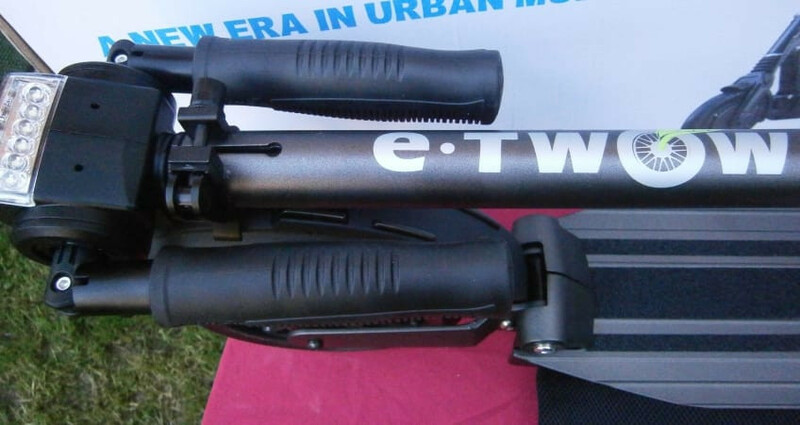 Again, the e-Twow was built as a kick scooter with added power. From a regular kick-scooter point of view it’s extremely high quality and the smooth ride helps you feel that you’re riding a quality machine. The front suspension coil is mounted at the base of the handlebar stem just below the joint with the kickboard. It has a rubber water splash cover to protect the coil mechanism and it’s extremely stiff which helps smooth out all those bumps in the road as you lean on the handlebars. It looks maintenance-free and is as high quality as any I’ve seen on a kick scooter. The rear suspension feels a lot softer than the front but that’s perhaps because I have most of my weight on the rear of the kickboard. 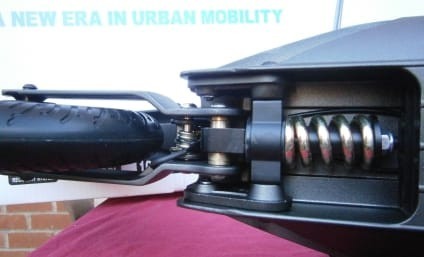 You can see the rear suspension coil exposed on the underside of the scooter and it works extremely well to absorb bigger bumps in an uneven road surface. The soft bouncing motion of the kickboard while moving over bumps actually give the scooter quite a luxury feel. Pretty much like a big Mercedes car slowly moving over an uneven road. As the rear coil is exposed underneath the scooter is will be susceptible to dust andmoisture from the road so I would advise cleaning it from time to time and perhaps a spray of WD-40 to keep it moving easily. Make no mistake, this is a very high quality electric scooter. As I said, it’s built like a top-quality kick scooter with all the power hidden away in the deck and the front wheel. So just from a Kick-Scooter standpoint it’s a top quality machine. Add to that the powerful electrics and you have a powerful, high-tech and great quality machine. I did not find anything on this scooter that I was disappointed about and I’m very fussy. Is the e-Twow Water Resistant? In a word, yes. I would be happy to take it out in light rain or on a wet surface because it looks as though all the electronic components are either completely sealed under the deck or frame, or in the case of the display look to be very well sealed to protect from water damage. That said, I would not dunk the whole scooter in water and expect it to work again. I would not expect it to be 100% waterproof. When you inspect the machine close up you will see that everything is well sealed and it will resist water well. I have to give the handlebars a special mention for two special features that I like a lot. 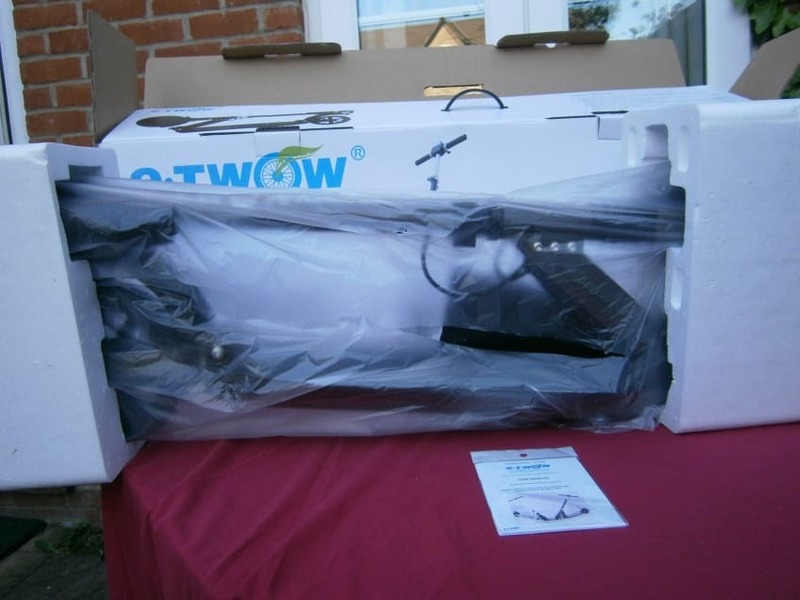 Both of which add to the overall high-quality feel and attention to details of the e-Twow. All modes are switched by pressing the light button on the control panel. The auto mode it neat because the scooter has a light sensor fitted and the front light will only illuminate on if the ambient light is down to a certain level. A useful feature as per most cars have these days. The rear light is rather clever and it's mounted onto the rear fender and it permanently on for safety. I like it because it illuminates brighter when you hit the brakes, so people behind you will know that you are braking. Anyone who has been behind a bicycle will know how useful this is! 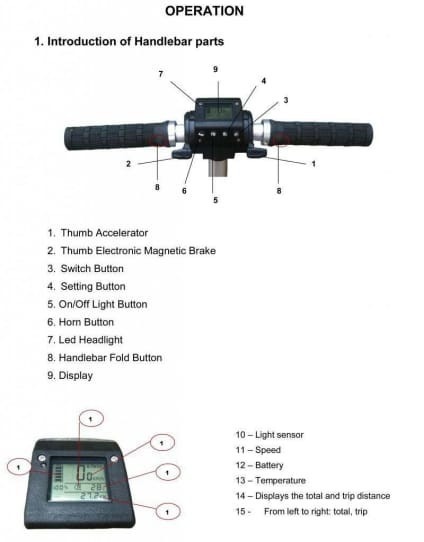 The e-Twow LCD display is mounted on top of the handlebar in the center. It's neat because it has a backlight that uses the light sensor similar to the auto mode of the front light. That means as it gets dark the backlight automatically illuminates the display. 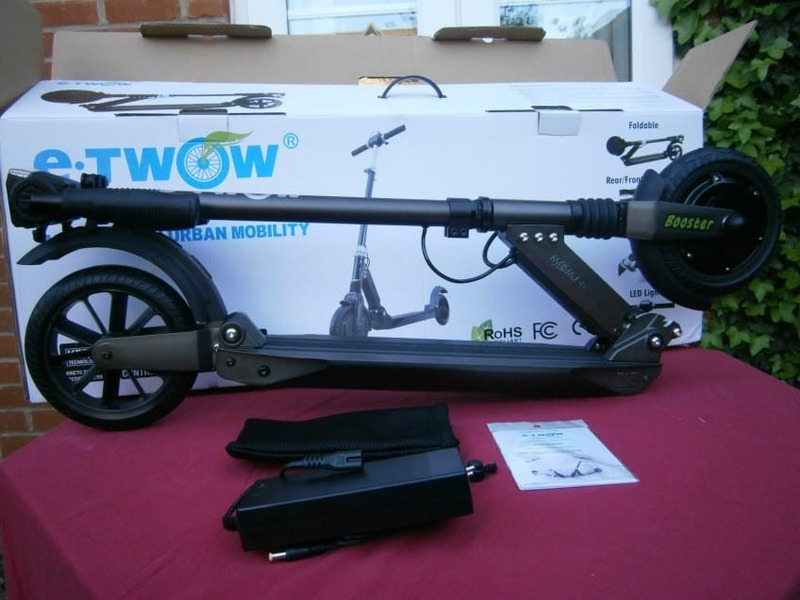 The folding mechanics of the e-Twow is top-notch and makes them very sturdy when in use which is a little unusual for all except the most expensive scooters. The folding ends of each handlebar is actually on a pivot-type hinge so they are not loose when folded. Again, I like the attention to detail on this 2017 e-Twow because they have thought about everything. The handlebar grips are very thick rubber and an ergonomic shape which makes them easy to grip for extended periods. The rubber absorbs vibrations and I didn’t get any of the shaky-hand experience that I have seen on cheaper kick scooters. Well done e-Twow on those grips! As well as looking good because of the stylish curved aluminum wheel-spokes the wheels are wider and larger in diameter than a regular adult kick scooter. This adds to the overall speed and stability of the scooter as larger wheels can travel faster. The tires are high quality and thick solid-rubber but they are soft enough to absorb vibrations as well as provide a good amount of grip on the road. The tires have a reasonably deep tread which will help in wet conditions. Although I haven’t done it yet I would happily ride the e-Twow out in wet conditions, whereas most kick scooters cannot handle a wet road surface. The powder coating type paint that is used in most high quality manufacturing these days is evident on the e-Twow and it’s a high quality paint-job. It is not lacquered which means that it will scratch fairly easily so be careful not to scrape your scooter! This 2017 model is available in White, Dark Gray, Purple, Black and Green. Each color looks great. Personally I went for the gun-metal Gray one, mainly because it looks grown-up and is less boring than black. My Gray scooter has a slight metallic finish to the paint which makes it looks rather special. 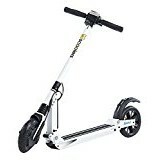 Do I Recommend You Buy the e-Twow Booster Scooter? In a word, yes! It’s a very high quality electric scooter. 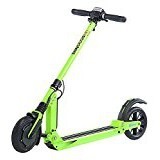 I particularly like it because you can use it like a regular kick scooter and it also looks just like a regular kick scooter. No-one would know it’s got all that power under the hood unless they saw it moving fast. The motor is extremely quiet; it just makes a slight whirring sound. I like the fact that you can use the motor to boost your speed and you’re not dependent on the motor all the time. This is an expensive scooter but if you are a perfectionist like me, you will not be disappointed. You definitely get what you pay for with an e-Twow Booster Scooter. One of the best adult electric kick scooters I have seen. You will not be disappointed! Let me know in the comments if you have any questions. I love this e-Twow S2 Electric Booster Scooter. You can see from the videos what a good time I have riding it. Well worth the money!